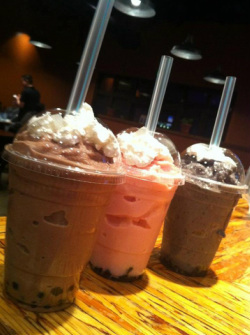 Boba literally means Big Pearls. Boba, also known as tapioca pearls or tapioca balls, is derived from the starch of the cassava root. When cooked perfectly, Boba becomes a sweet, chewy ball with a gummy-bear-like texture. When combined with the tea, it adds a fun twist to the drink. Freshly made limeade with every order.